I am getting into Napoleonics after a long absence and want advice on good figures available and rulesets. Would like to game either Waterloo or Borodino, hence the small scale size. Thanks Jonnathon. Magister Militum due to costing more. Believe it or not, unless really abstracting, those 2 battles are 2 of the biggest of the era. You will need to probably go with a brigade equals a stand or similar. 2. How many figures per unit? 3. Do I abstract formation or do I represent them? Blucher would be good as one stand can equal a brigade. Playing card size stands but you could always go smaller? Each stand us a mini diorama. Personally, I prefer multi-stand battalions. The least amount I have seen allowing visual representation of squares, columns and line would be March attack. 2 stands make a battalion but stands are much smaller. Older set includes Napoleon's Battles where one small stand equals a battalion. Also Shako II. I actually like De Bellis Napoleonicus using the attrition rules. Infantry is on a 20 by 40mm stand representing a brigade. We play it with 10mm here. You could go with smaller stands if wanted as well. Just as long as you match the opponent. I am looking at doing General d'Armee but no more than 3 corps a side and in 15mm. Battalions are 6 stands of 4 figures each. So more figures and more space. Could do larger battles but space would be huge. And needing multiple armies would require a huge investment in figures and painting time. Pendraken all the way- I am doing a similar project for the 100 hundred days, using General D'Armee. I will try to post some pics of my efforts so far if you like? Honestly the customer service, figure quality etc I do not buy from anyone else at the moment. The Dutch/Belgians have just been released and they look great. For general D'Armee I am working toward the average 5 Brigades per side though so I won't be re-fighting Waterloo, I will be doing bits of it though and looking to push out toward multi corps eventually. I just received some samples from Pendraken from their 1809 range and they are quite detailed. I will try to post some pictures when painting is complete and some Old Glory cavalry as well. I am considering Volley and Bayonet or Blucher for rules. My preference on 10mm Napoleonic Figures is Old Glory. They come on five-figure sticks, which makes them very fast and easy to paint. They also have separate skirmishing figures are are often useful. Magister Militum are also quite good, but I recommend you look at the Old Glory offerings. 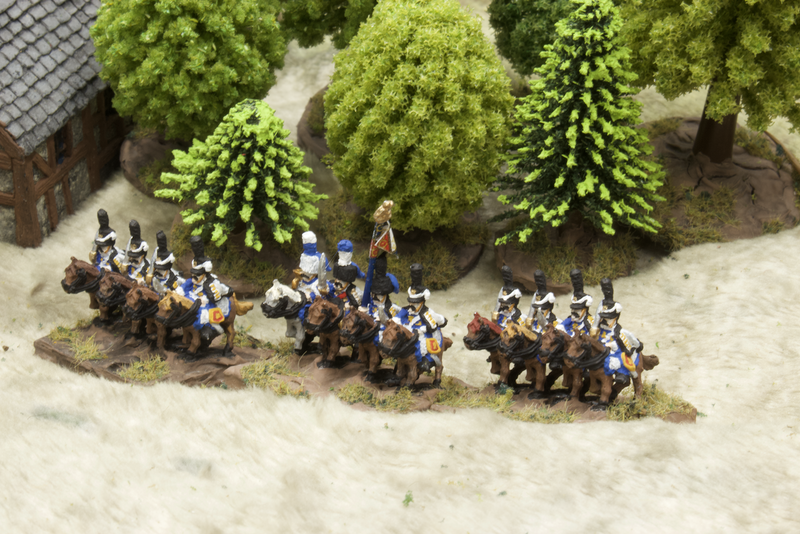 Most of my 10mm Napoleonic collection is from Old Glory. 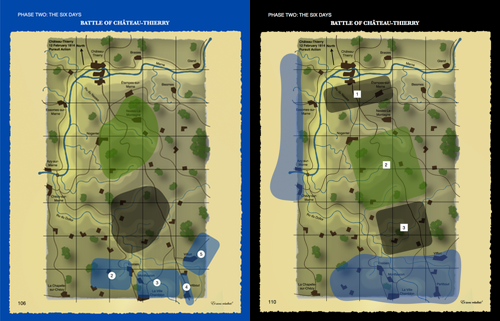 As for rules, I will put in a shameless plug for Fate of Battle (http://www.bucksurdu.com/Buck_Surdu/LSNC__NAP.html). I second Old Glory 10mm as the basis for armies supplemented with minis from others. Pendraken are, for me, the best 10mm Napoleonics on the market. There are gaps in the range, no Peninsular War figures for example, but for Waterloo no problem at all. Old Glory are nicely detsiled, but I duslike the infantry in strips. The cavalry are very nice sculpts, but smaller than Pendraken. Bend Sinister figures are very fine, anatomically more accurate than other ranges, so a bit slimmer. The range is mainly for Waterloo. The original intention was to make a range compatible with the GHQ sculpts, which are available from Magister Militum in the UK. Not always easy to get a response from the owner, but I think the figures are worth getting. Magister Militum's own figures are significantly chunkier than Pendraken. They do have a very complete range, including the elusive Peninsular Spanish, Portuguese and early British in stovepipe shakoes. I have seen complaints that the castings are now carrying excessive amounts of flash and are difficult to clean up. A relatively new player in the 10mm Naps market is Lancer. I find them a bit " gnomic" but they have their fans and they are certainly doing a good job of rapidly expanding the range. 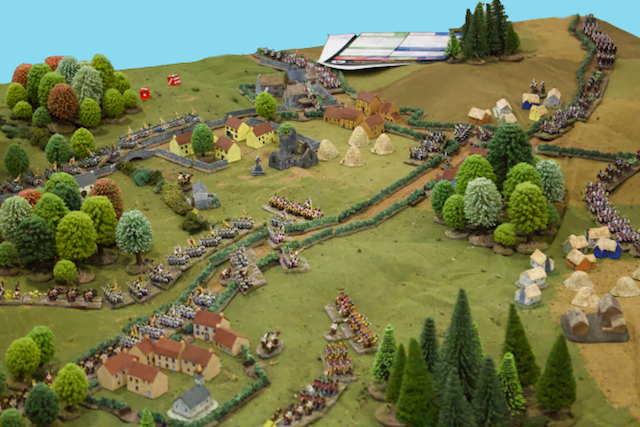 If you are wanting to play large battles, then the old stager Napoleon's Battles is definitely worth a look. An infantry brigade will usually have 4 to 6 stands, each one has 3/4 inch frontage (1 inch for British and later Portuguese) x 1inch depth, cavalry are on 1 inch x 2 inch (although I use 1inch square bases and put two together, as I like to play other rule sets like Over the Hills and General D' Armee). Last week we used these rules to play Eylau on 9 foot x 4 foot table, but have done Quatre Bras on a 3 x4, and other battles on a 6 x4. Thus if you are using x stands to the Battalion, you will be the divisional commander, with command stands representing Brigadiers. We played a ACW battle as a mini campaign – Maneuver the Divisions and Corps on a map, and as they came into 'table range' play that bit As Divisions. Sometimes 3 different games/evenings were three divisions fighting simultaneously. 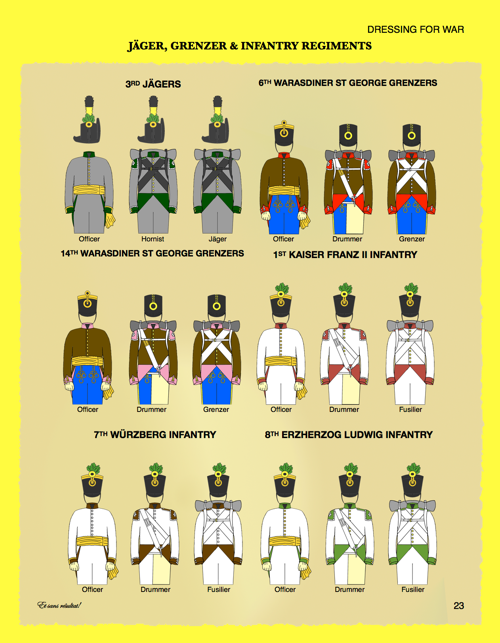 Old Glory infantry are great but limited ie the French only in shakos no line in bicorns or overcoats. Some cav needs to be put together. Pendraken have great service and nice individual castings. These take longer to paint. Rules-wise, I suggest you look at a Snappy Nappy (better than the name, I swear) or Blucher if you're looking to refight whole battles. The multi-based battalion rules only do the mid- or large battles if you have thousands of minis, numerous players, and 14 feet of table. Great if you do, but for those of us with a 6 x 4 table, I'd use the aforementioned rules to do a full battle. I would go Pendraken and Bend Sinister, which is what I have got, naturally… Pendraken are continuing to release figures and I understand the Peninsular is in planning. but not soon. As marmont1814 mentions, a big question is what you're going to play. ESR Napoleonics is focused specifically on the scope of game you're looking to do, and even if you decide you prefer a different rule system, we offer a growing series of ESR Campaign Guides that provide scenarios with briefings, maps, and OBs, along with extensive uniform guides, that you can use with nearly any rule system. But… if you do find ESR is for you, we offer Box Sets of miniatures, bases, and flags that are conveniently configured – and they are in your desired scale. Not sure where you're located but we are in North America and Magister Militum carries our rules and Box Sets for the UK and EU. Hope some of what we have is helpful, and welcome back to Napoleonics! The orders of battle we provide are down to number of battalions and such, we include a summary statement of average battalion strengths during each campaign as well. The reason that we do not provide strengths itemized per battalion is that they are far more commonly unknown than known, however, campaign-averages are generally possible to determine. I have a fair number of Magister Militium figures but they are slightly larger figures. They also have some errors, for example the Spanish grenadiers lack the distinctive long "flame". As far as I can tell they're just Austrian grenadiers renamed. Old Glory. Well their equipment is good and they do some items that the other manufacturers don't. Easiest artillery and equipment to assemble. Their cavalry is two part castings and best glued before painting as some of the fits are bad and the figures need filing. There infantry come in 5 man strips that don't work with my basing system. Worst yet they have molded flags that are horrible. GHQ – an incomplete line for Waterloo. The metal is very flimsy and the muskets bend very easily. I'm currently replacing all my GHQ infantry because of this. THeir cavalry are horrible. They have very deep bases, some 30mm, you will loose about 50% of swords during the shipping process, You'll loose the rest in painting and playing the first game. Their artillery castings are nicely done, but their gun crews are flimsy. I've GHQ guns with OG crews and that works. Bend Sinister, Si is a great bloke, but he's had some issues over the last few years. His range seems smaller than it was and his website isn't user friendly. Smaller than Pendraken/Lance but some nice figures in there. BTW, hopefully Tom Dyer will reinstate his excellent AIM figures some day. Slowly working on that Elliott. My list of 10mm Useful Wargaming Manufacturers. hope it helps. Our range is geared up for earlier than Waterloo as saw the figures were already out there, and my favourite battle is Austerlitz although we are creeping into the Peninsular just because a lot of our customers have asked for them, and early Prussia is getting enlarged just because I like the uniforms.